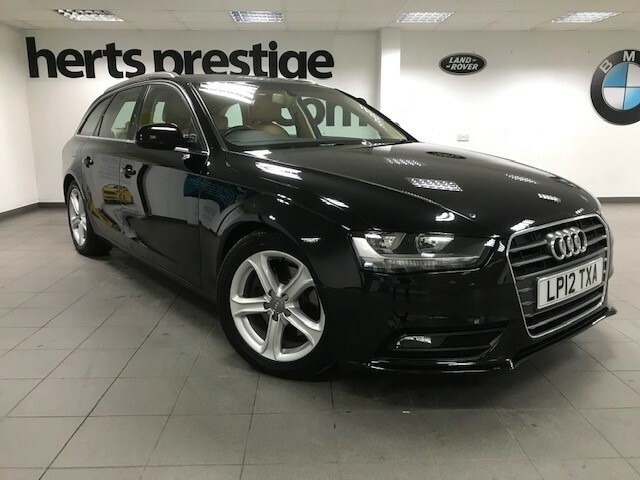 HERTS PRESTIGE ARE PLEASED TO OFFER THIS GREAT VALUE A4 AVANT IN BLACK WITH FULL BEIGE LEATHER, THIS VERY NICE AVANT IS AA INSPECTED WITH FULL SERVICE HISTORY, TIMING BELT + WATER PUMP REPLACED, WE HAVE JUST HAD SERVICED WITH NEW MOT--LOW DEPOSIT FINANCE AVAILABLE--ALL OUR VEHICLES ARE HPI CLEAR AND PRESENTED TO THE BEST USED CAR STANDARDS. SAT NAV, BLUETOOTH, DAB RADIO, FULL LEATHER, PARKING SENSORS, LEATHER MULTI FUNCTION STEERING WHEEL, AUTO LIGHTS, PLUS MUCH MORE, All Herts Prestige Cars Are HPI Clear, Part Exchange Possible, Finance Available, We include a 3 Month Warranty with our cars, or you can buy a Comprehensive National Warranty that covers Most Electrical + Most Mechanical Components ,these warranties cover factory Fitted Parts @ Any VAT Registered Garage, Please ask for details of this superb optional cover available from 6,12,24 or 36 Months from only £ 299 please ask for details. Our Showroom is located at 5-5a South Road, Bishops Stortford, Herts, CM23 3JG with Customer Parking. Our Double Cab Centre is located @ London Road, Spellbrook, Herts, CM23 4AU with Customer parking Please call us on 01279 655124 to view any of our vehicles at either location, Open 7 Days A Week.